The Polaroid SX-70, the camera Pat Sansone of the Autumn Defense pays homage to below, was one of the first cameras I recall using. I still have it today. It was my fathers, himself an avid photographer, purchased several years before I was born. Like the images the SX-70 punches out, the Autumn Defense draft a kind of Americana that feels at once lived in yet crisp and new. This duality continues to play out on the duo’s third full-length, Once Around, out this month on Yep Roc. I read a statistic recently that about 2.5 Billion photos are uploaded to Facebook every month – about 964 pictures a second. You see it happening everywhere. Every telephone most of us use now is also a camera. The idea that a photograph can be taken, seen, and shared instantly is long past seeming magical or even novel. Now for most of us it happens dozens of times a day. If you are a performing musician and you are on stage playing a show when you look out into the audience it seems that more than half of the crowd are watching the show through the screen on some sort of digital capturing device. Photography has never been more instant than it is now. The Polaroid SX-70 appeared in a time very different than ours. A slower time. I was only a few years old when it was released by the Polaroid Corporation and I don’t think anyone in my own family or group of friends had one. I’m not sure how easy they were to find in Meridian Mississippi in 1972. 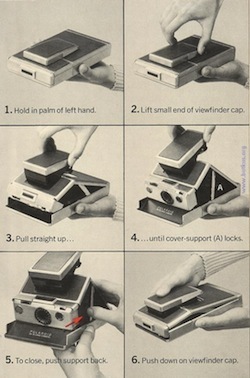 The original model SX-70 was not a cheap amateur’s camera, but intended for serious use. It retailed for 180 bucks when it first appeared…not cheap in those days. I imagine it being first owned by gadget hounds and tech-heads of the day – the kind of folks who might have subscribed to the Sharper Image catalog or had really great stereo systems with top notch reel to reel tape players on well organized bookshelves. The camera was a design marvel and is considered by most Polaroid enthusiasts as Edwin Land’s masterpiece. It was an extremely complex camera with features that no Polaroid camera had previously: true Single Lens Reflex viewing, incredible depth of field versatility and exposure. The real magic was in the glass lens bringing a sharpness to the images not readily achieved with other Polaroid cameras. When unfolded the camera almost looks like a little spaceship, and the apparatus folds flat into a whole other sleek modern object…just as cool looking as the camera unfolded. The iconic superstar design team of Charles and Ray Eames loved the SX-70 enough to make a beautiful 11 minute promotional film in the early 70s that is both a technical explanation of the camera and a poetic, Zen-like visual tribute to its wonders. I bought my first SX-70 about 4 years ago on one of those dangerous eBay tangents. At the time I was somewhat obsessed with Kodachrome and Super 8 films after seeing a collection of film collages by the artist Joseph Cornell. Somehow looking around at old Super 8 ephemera led me to an auction for a Polaroid SX-70 that was modified for the then readily available Polaroid 600 film (the original film that was made for use with the SX-70 was discontinued in 2005). Something about the particular photo of the camera and the description in the auction peaked my curiosity and I thought I would check it out, add it to the small collection of toy cameras I had lying around that I would sometimes dabble with. I realized after the first pack of film I shot after it arrived that it was no toy at all. The details were sharp and textured, but the colors romantic and painting like…I felt I had stumbled onto something magic – a little portal into a realm that was both mysterious and at the same time familiar and slightly nostalgic. I was instantly hooked. Almost immediately I began an obsessive shooting spree with that SX-70 carrying it with me everywhere; always in my car or in a bag around my shoulder while roaming around unfamiliar towns on tour…photographing without restraint. It seemed to make even the most ordinary things look interesting to me and most things seemed worth photographing. The Polaroid film was extremely available…If I ran out of film I could just pull into a CVS or Walgreens and grab 20 shots for about 15 bucks or so. On days when the light was sympathetic, I might return home with 20 new photographs to lay out on the table. It was quietly exhilarating to discover a new pastime. Then…in early 2008 the sad news came down that Polaroid would DISCONTINUE the production of ALL of their instant films. I couldn’t believe it. I knew that at some point in my lifetime we would start to see favorite technologies disappear…. I mean I regretted that I never sent a telegram before those disappeared in 2006 but I wasn’t expecting Polaroid to go quite yet. I had only been really getting going with this. It seemed so unfair. I bought as much film as I could that spring finding myself in Wal-Mart photo aisles in small towns asking clerks with quizzical looks on their faces “do you have any more in the back?”. Today even the freshest of the film that I collected expired over a year ago and the colors have started to change. I continue to shoot but the reality is that I don’t shoot the same way that I did for those first couple of years of being in love with the camera. I feel that now I have to be more selective and so the occurrence of those happy accidents is somewhat lessened. Perhaps the film’s scarcity has made me more conscious of the act of composition and of the real uniqueness of each moment that the shutter opens and closes. It has deepened my appreciation for photography itself, as well as my respect for truly great photographers. I suppose this is the deeper meaning that the SX-70 points to for me – the intersection of old and new modes of being…a connection to the slower quiet sense of time of the past, the instant gratification that the present encourages and almost requires. The process of taking and experiencing the Polaroid photograph is immediate but not completely instantaneous. There is a span of several minutes of waiting, watching, and hoping…of experiencing possibility itself. Those several minutes of pausing and reflecting can feel truly expansive compared to the time it takes to SMS a photo taken seconds ago with your cell phone. I am of an in-between generation…a generation that remembers life before personal computers and cell phones but now can barely operate without one. My attention span is not what it once was, nor what I would like it to be. The SX-70 offers me the bridge between those two parts of my inner life, the longing for the slow soft analog tones of my past without having to wait too terribly long to get to them. thank you for this. mucho. Here I thought I was the only one who feels that this digital age is stealing my attention span. It’s very comforting to know that analog is still appreciated.